Brian Lohman MFG is a manufacturing division. We manufacture some of the finest 1911's in the world. We are currently making model YMIR which is a commander style 1911 in .45 acp. The frame which is made out of 4130 high carbon steel will be color case harden and have a bobtail .250 radius cut. The slide made out of 4340 high carbon steel will be high polished blue on the sides, and the top will be satin blue with classic style slanted serrations. We will use Novak LoMountt carry 1911 plain black VU Notch rear sight and the front sight will be dovetail .075" 14kt. Gold Bead .180" Each gun with come with one serialized 7 round Mec-Gar Magazine, and one 8 round Nickle plated Mec-Gar Mazazine. The grips will be hand made out of Redwood Lace Burl. We will serialize 16 parts with an American Eagle proof and serial number that matches the frame. 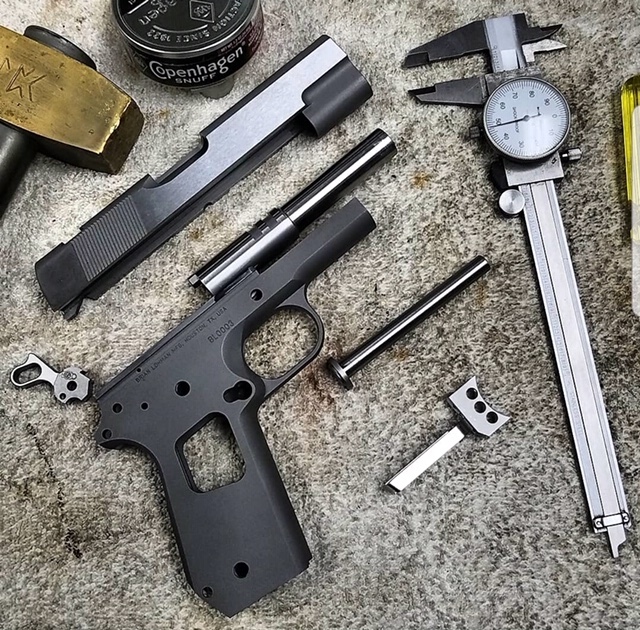 The parts we are serializing are: slide, barrel, barrel bushing, recoil plug, guide rod, firing pin stop, extractor, hammer, trigger, thumb safety, slide stop, magazine release, mainspring housing, magazine, and grips.